It’s not every day that you find a classic album for $2. 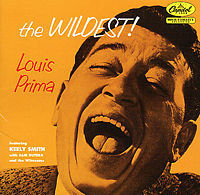 But last Saturday, in one of the crates at a booth at a nearby antiques mall, was this great album from 1957: “The Wildest!” by Louis Prima. If you saw Keely Smith duet with Kid Rock at the Grammys the other night and wondered why, here’s why. Listen to “The Wildest!” and you’ll hear Smith the sassy singer, Prima the legendary hipster and their backing band, the sizzling Sam Butera and the Witnesses. It was recorded at Capitol Studios in Los Angeles on April 19 and 20, 1956, in a session loose enough to make it seem like it was recorded live at Prima’s usual stomping grounds, the Sahara lounge in Las Vegas. It lives up to the album title. It’s the wildest, man. If not now, then certainly in January 1957, when it was released. It was swing and jazz to be sure, but you could see rock and roll in the distance. Yes, this is a 51-year-old piece of vinyl. Which may explain why it was sold “as is,” for $2. Perhaps the seller never gave it a spin. The sound is almost perfect, save for the occasional pop you’d expect after all that time and all those plays. “Just A Gigolo/I Ain’t Got Nobody,” “Nothing’s Too Good for My Baby,” “The Lip,” “Body and Soul” and “Oh Marie,” Louis Prima, from “The Wildest!” 1957. It runs 15:13. Tonight on The Midnight Tracker, we catch Ike and Tina Turner just past the peak of their popularity. They’d hit it big with covers of Sly Stone’s “I Want to Take You Higher” in 1970 and John Fogerty’s “Proud Mary” and the Phil Spector-produced “River Deep, Mountain High” in 1971. But by 1972, when “Feel Good” was released, their career arc was headed downward. By 1976, it was over for Ike and Tina. Tonight’s album strays from the formula that put Ike and Tina on top of the charts and returns to their R&B roots. Whether that was the record company’s idea or Ike and Tina’s idea, who knows? “Feel Good” has only one cover — the Beatles’ “She Came In Through the Bathroom Window” — and nine songs written by Tina Turner. Though it apparently didn’t make much of a dent in the charts, “Feel Good” holds up nicely. Ike orchestrates a blistering mix of soul, R&B and early funk, and Tina’s voice oozes sizzle and sensuality as always. Though it’s barely two minutes long, the fourth cut, “I Like It,” manages to work in some nasty Hammond organ, a solid bass line, energetic horn charts and plenty of wah-wah guitar. “Chopper,” “Kay Got Laid (Joe Got Paid),” “Feel Good,” “I Like It” and “If You Can Hully Gully (I Can Hully Gully Too),” Ike and Tina Turner, from “Feel Good,” 1972. It runs 14:19. When Lou Rawls passed two years ago, the music blogs were full of wonderful tributes and samples of his remarkable performances. Ever since, I’ve been looking for just the right Lou Rawls album. I’d come across several, but they just weren’t it. One or two good cuts, especially on the albums from the late ’70s on, but not enough to merit buying. Until I came across this one last fall, that is. 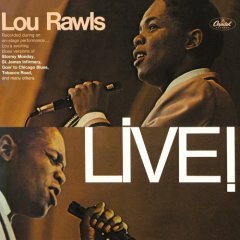 “Lou Rawls Live!” is solid from start to finish. Recorded before a room full of music industry folks in Los Angeles in 1966 and produced by David Axelrod, it has everything you’d want — jazz, blues, soul and Rawls’ trademark stream-of-consciousness patter between some of the songs. The backing band is outstanding, too — James Bond on bass, Earl Palmer on drums, Tommy Strode on piano and Herb Ellis on guitar. Rawls was 33 when he recorded this album, but really was just getting going as a solo performer. His first Capitol Records album, “Stormy Monday,” was recorded with Les McCann and released four years earlier, in 1962. Before that, Rawls sang with and backed Sam Cooke, a pal since their days together in high school in Chicago. Let’s give it a spin and head back to a scene that seems long gone. “Stormy Monday,” “Southside Blues (monologue),” “Tobacco Road,” “St. James Infirmary,” “The Shadow of Your Smile” and “I’d Rather Drink Muddy Water,” Lou Rawls, from “Lou Rawls Live!” 1966. It runs 22:18.